Tag Archive | "OE Supplier"
There are some companies that make like to play on their country of origin: some of which you can probably think of – and perhaps it is no wonder. For example, anyone who has ever visited the Dubai edition of Automechanika will know that a great number of visitors will head straight for the German pavilion without looking at the rest of the show, such is the power of Brand Germany’s reputation for Teutonic efficiency. 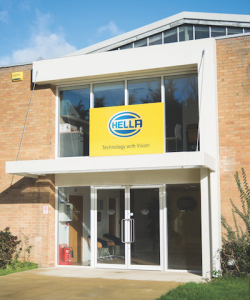 Hella is a German business with a global footprint. It is larger than you might imagine. It has constantly been in the top 50 largest global automotive suppliers and in the top 100 industrial companies in any category in Germany and worldwide operates a dozen joint ventures, although few people will know this. The quality of the products has never been in doubt, but prior to a marketing campaign that started earlier in the year, not everyone knew what the company offered. “I think we’ve been focused on developing the products and service but not on sending that message to the market” explains Matthew Say, Managing Director, “We’ve just built a very good business under the radar. We’ve grown every single year in the UK, but we’ve done it by stealth. There are a lot of companies that make more noise than us but are going backwards. Now it’s our turn to make some noise, not to scream and shout, but I think if you are going to take a message to the market it is always better to do that from a position of strength and growth”. This strategy has already started to take place. You might have noticed the cover gatefold on the June issue of CAT as well as the adverts on the inside pages – and this is just one of many examples of the brand increasing its visibility to the motor trade. One of the reasons why the firm is now ready to actively promote itself is the acquisition of an 83,000 sq. ft. site in Chipping Warden. The core of the newly refurbished space is a warehouse that is much larger than the firm previously had which means availability has improved. It also boasts improved processes, such as pick-by-voice and barcode-indexed stock. The rest of the site provides a training workshop and conference rooms. A larger, leaner space means more stock is available to be picked and once easier to get through the door. “There is a very good availability and the parts arrive when we say they will” says the MD. Also, the range is developing and growing quickly –we can react far quicker than we did [when delivering from the previous location]”. The improved space meant that the firm could write a ‘customer charter’. “It’s a service commitment to our customers” explains Say. “We wanted to provide a written guarantee that their phone calls and emails will be answered and that our logistics will be first class”. He added that the decision to put a charter in place arose from a discussion with colleagues about how it felt as a consumer to receive poor service from a large company, such as a utility firm or a telco. “Dealing with a poor representative on the phone will shape your impression of the business. From our perspective, we just wanted to eradicate those negative things – and keep it customer centric” he said. To help with the expansion, the firm has recruited a number of staff over the past year. Among others, Iain Molloy joined as a Business Development Manager with the garage equipment team, Matthew Smart is a new Product Manager, Nicky Coombe joined as a Credit Controller , Bill Johnson, Sales Director, Chris Griffin, Head of Pricing, Helen Goldingay, Marketing Manager, and Matthew Say himself is reasonably new to the firm, having joined the company in 2015. 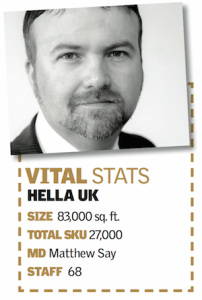 The new facilities and plans should help Hella keep its brand ahead of the competition. “We’ve been here for 42 years and at the moment we are looking at great growth cycle that looks set to continue. We are truly delighted with our progress over the past year, culminating with approvals from all the major groups and networks” concluded Say.